A new study based on results of the 2012 Canadian Community Health Survey―Mental Health shows that 11% of 15- to 24-year-olds met the criteria for depression in their lifetime, and 7% experienced depression in the previous year. Among those who were depressed, the symptoms were most likely to interfere with social life, followed by close relationships, and attending school. An average of 25 days of regular activities were missed in the previous year because of the symptoms of depression. Severe depression has been shown to be associated with suicidal behaviour, ranging from thoughts to plans to attempts and deaths. Half of the 15- to 24-year-olds who met the criteria for lifetime depression reported that they had had suicidal thoughts at some point. This represented 5% of all Canadians aged 15 to 24, or approximately 234,000 young Canadians. There are other reasons youth might have suicidal thoughts unrelated to depression. These reasons include stress, and negative social behaviours such as bullying. Overall, one in seven (14%) 15- to 24-year-olds reported having suicidal thoughts at some point in their life, and 6% had such thoughts in the previous year. Although most young Canadians had never had suicidal thoughts or been depressed, suicide was the second leading cause of death among those aged 15 to 24. In their lifetime, 5% of young Canadians had made a suicide plan; 2% had made such a plan in the previous year. The percentage who reported making a suicide attempt at some time in their life was 4%. However, half of those who had made a suicide plan and half of those who had attempted suicide met the criteria for lifetime depression. Depression and suicidal thoughts were more common among young women than young men. Also, the prevalence of both depression and suicidal thoughts was higher among those who lacked emotional support or had a relatively low ability to deal with stress. More than one-third (36%) of those with lifetime suicidal thoughts, and 42% of those with lifetime depression, consulted a professional source for mental health support during the previous year. The professional sources most frequently reported were general practitioners and social workers/counsellors. Young women were more likely than young men to seek professional mental health support. Immigrant youth were less likely than non-immigrants to consult professional sources. Among Canadians aged 15 to 29 with lifetime depression or suicidal thoughts, 60% sought informal help. Friends and family were the informal sources most commonly reported. In the previous year, 28% of young people with lifetime depression and 22% with lifetime suicidal thoughts had looked on the Internet for mental health support. The data are from the 2012 Canadian Community Health Survey–Mental Health (CCHS–MH), which targeted the household population in the 10 provinces. The analysis pertains to 4,031 respondents aged 15 to 24, weighted to represent more than 4.4 million individuals. The CCHS–MH administered the World Mental Health—Composite International Diagnostic Interview 3.0 to detect six mental disorders, including depression. A diagnostic algorithm identified respondents who met the criteria for depression (lifetime and past 12 months). This measurement tool was also used to examine suicidal ideation. 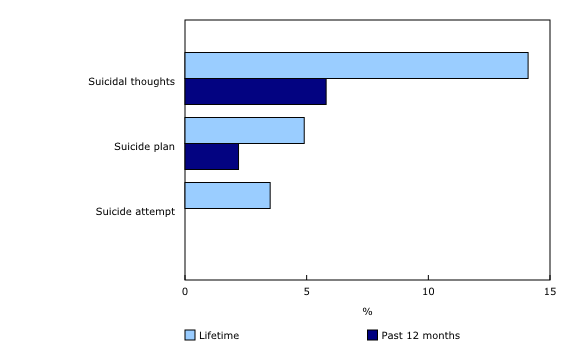 Respondents were asked about: suicidal thoughts in their lifetime and in the past 12 months; having "made a plan for committing suicide" (lifetime/past 12 months); and having "attempted suicide or tried to take your own life" (lifetime/past 12 months). Respondents were asked if, during the past 12 months, they had seen or talked on the telephone with various professional and informal sources of support about problems with their emotions, mental health, or use of alcohol or drugs. "Depression and suicidal ideation among Canadians aged 15 to 24" is available in the January 2017 online issue of Health Reports, Vol. 28, no. 1 (Catalogue number82-003-X). This issue of Health Reports contains one other article, "Tanning equipment use: 2014 Canadian Community Health Survey." To enquire about the article "Depression and suicidal ideation among Canadians aged 15 to 24," contact Leanne Findlay (leanne.findlay@canada.ca), Health Analysis Division. To enquire about the article "Tanning equipment use: 2014 Canadian Community Health Survey," contact Health Canada media relations (613-957-2983). For more information about Health Reports, contact Janice Felman (613-799-7746; janice.felman@canada.ca), Health Analysis Division.